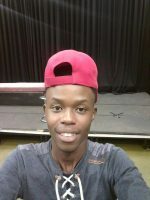 I am a 22 year old male, based in Hammersdale, a township near Durban. I have three years experience as a lighting operator, and 1 year as a stage manager. I have worked at the University of KwaZulu Natal Edgewood Campus for the past three years till date. I also have 2 years experience as a theatre manager at the University of KwaZulu Natal Edgewood Campus. I also participated at the Grahamstown National Arts Festival as a light operator for The Bedroom Epics and Peace Magents Stage Plays. Capabilities: Light Designer, Light Operator, Stage Manager, Theatre Manager.